After a one night stay in Nairobi, we (Tonya, Kristen and Dan) went to Tanzania to do one week of safari, and one week climb of Mt. Kilimanjaro, all done through Abercrombie & Kent tours. Our week of safari included a stay at different lodges and multiple game drives in nearby parks each day. We saw amazing animals at all the game parks. Traveling between parks each day we saw much of the vast farm lands and communities in the Tanzanian countryside. In general, all the people in Tanzania are very friendly -- all the people and kids on the side of the road waved at us, and all the locals at the places we stayed always said a warm 'hello', or 'Jambo'. We were not sure whether our accommodations would be along the lines of luxury tent or hotel -- they were progressively more luxurious lodges with outstanding views and service. 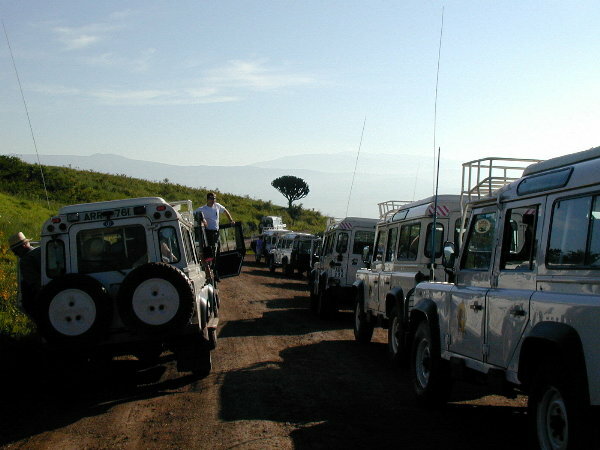 We enjoyed multiple parts of Tanzania, from the safari areas to Arusha and Mt. Kilimanjaro. In general, everyone was very nice and very courteous. We must say that Tonya got more attention that we did -- she was often mistaken for a 'local', traveling with some tourists. They were extra nice to her -- but we were able to sponge off that treatment. Probably the most prevalent beast on the safari was the fly -- they were everywhere! Most were the standard household looking type, but some of them bite. It was hard to determine which of the household types were just annoying and which actually bite. But all the damn Tse Tse flies will bite, even through clothing -- much like a horse fly or deer fly! It was impossible to get away from them. Whenever we stopped to look at an animal, they would converge on the truck. They also seemed to annoy the animals -- most movement by the cheetahs and lions was to avoid the flies! We learned quickly that there are two times in Tanzania: Tanzanian time, and English Time. Tanzanian time uses a 12 hour clock, with 1-12 representing daylight hours and 1-12 representing night time hours. 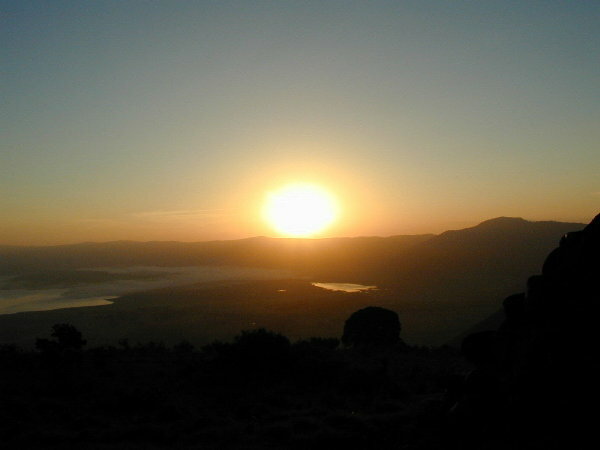 The daylight hours started at the hour of the sunrise, 6AM. So 6AM in English time is 0:00 in Tanzanian time, 7AM is 1 o'clock, 8AM is 2 o'clock, etc. Likewise, 7PM is 1 o'clock, 10PM is 4 o'clock, and midnight, is 6 o' clock, etc. We had to be very careful to determine whether someone was talking in Tanzanian or English time -- they were always willing to convert to English time. 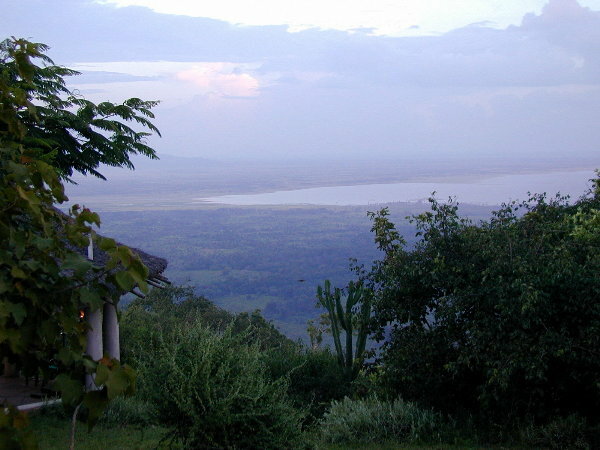 The Lake Manyara game park is just below our lodge (about a 20 minute drive.) The park is fairly small but includes the beautiful lake. As we approached the gate we saw tons of baboons in the roadway. At many points in this park, we stopped and watched groups of 10 to a 100 baboons playing in or near the road. We also saw giraffe, elephant, zebra, impalas, water buffalo, wart hogs and lots of birds (it was clear to Hosea, our guide and driver, that none of us are 'birders'.) Only the few giraffe, elephants, and many impala, and of course the baboons, were close enough for good pictures. 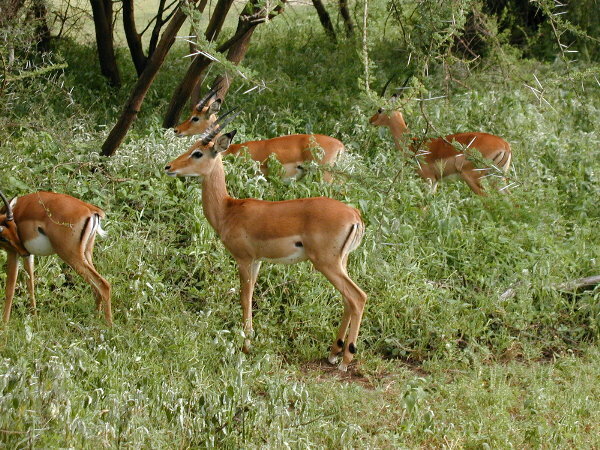 An interesting point about the impalas -- there were many 'bachelor herds' consisting of all male impalas. The strongest male in a group gets his own herd of females (20-30 of them!) for mating. So, we would see the one stud impala with his harem, and then the many sad bachelors hanging out together. 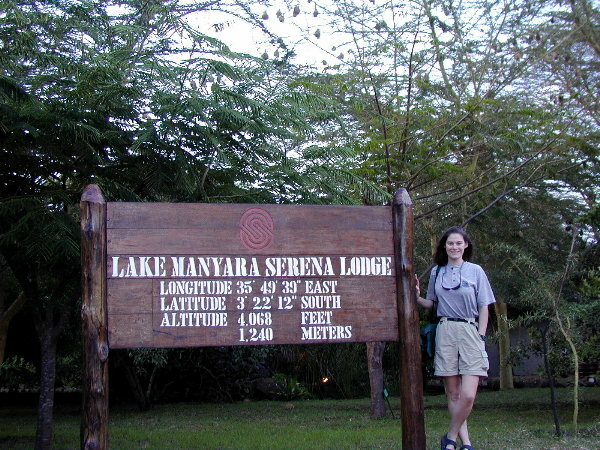 The Lake Manyara Serena Lodge was very luxurious compared to the tents we had been expecting. The lodge was positioned on the ridge over the lake and all rooms looked out over the lake. The lodge had all the amenities (warm water, power, full restaurant/ bar, etc.) we could ask for. They even offered email! But offering email meant that you could write down on one page what you wanted to send and they would radio it to another location that has internet connectivity and they would type and send it, as well as relay verbally any responses. At $10 a page it was not worth trying! The dinner was an extensive buffet and it was very good. They even had an acrobatic show after dinner. After our morning game drive at Lake Manyara, we drove over very rough roads (tons of pot holes) to Gibbs Farm for lunch. Gibbs Farm is an quaint inn on the side of mountain that has gardens, walking trails, and great views of coffee fields and farms. Someone said it was listed as Conde Nast's #7 greatest inn in the world -- though we are not sure in what category. We could not do the walk to the waterfall where elephant and buffalo are supposed to come to drink because it was raining. The lunch was another excellent buffet! The drive to Ngorongoro Crater was very bumpy, even though we avoided most of the major pot holes. When we got to the crater, we stopped at the first scenic view and it was amazing. 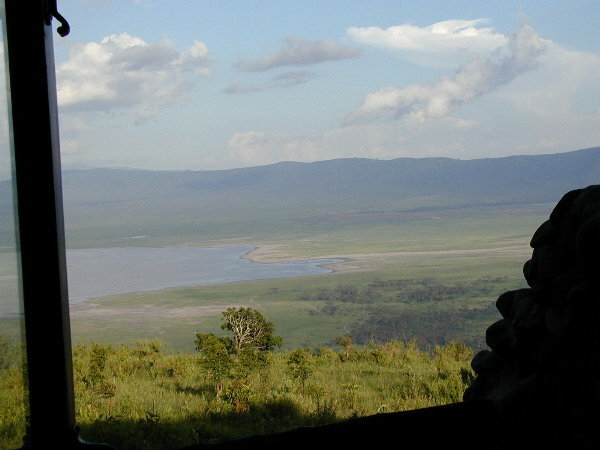 The crater is 102 square miles and with binoculars we could see elephants at the bottom in the open fields. 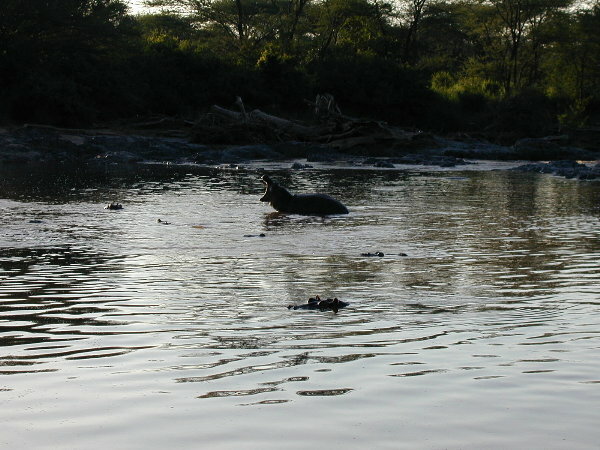 Hosea said that this is the only place in Tanzania that you can find the black rhinoceros. The crater is a collapsed volcano and is managed as a conservatory, not a national park. 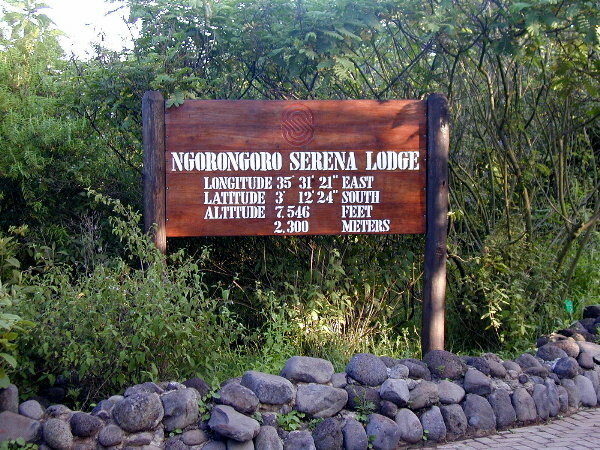 The Ngorongoro Serena Lodge is positioned on the ridge of the crater, overlooking the huge park. Our room view was spectacular. Since the lodge was at 7,500 feet altitude, it was chilly at night. The stars were amazing at night because it was so dark. The sun rose just over the crater across from our windows! The Serena lodges are getting progressively nicer -- this one is even more luxurious than Lake Manyara. We left for the crater park at 8:15AM and made it to the gate just before 9AM. There were 20 groups registering to get in when we arrived. It went pretty fast, but it was amazing to see how crowded it is when all the groups are in one area. 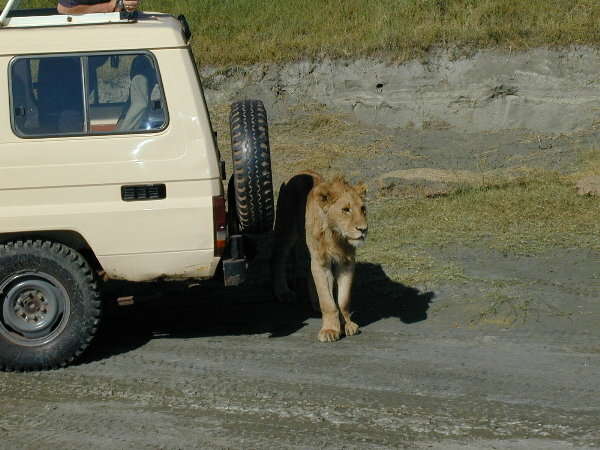 We had heard two things about the Ngorongoro: 1) it gets crowded, and 2) the animals are very tame. We immediately felt the first one, and when we came upon a pride of lions the second became clear also. As we were the 4th truck to roll up near the pride, we knew they were not bothered by vehicles. One of them even got up and came over to lay in the shade of our truck! When we started driving off we worried we might run over his tail, but he did not even move. It is very rare to see cheetah in the wild (or at least in Ngorongoro Crater) because their number is limited, and they are shy and stay away from people. So, when we spotted two cheetah stick their heads up out of a grass field some distance off, we stopped to track them. We spent about two hours as they inched (literally) closer. We got great views of them via the binoculars, but they were still way too far for the digital camera. Tonya took 4 rolls of pictures of just the cheetah with her high powered lens, so I am sure we got at least one wall-hanging worthy picture from that! We almost saw a huge fight between a Cape Buffalo and a Lion, likely to be a kill on one side. The Cape Buffalo don't typically beat the lion, but they often try because they are so big and generally don't like lions. Hosea saw the potential from a long way off, so we went closer and waited it out. A pride of 16 lionesses with one lion and 2 cubs were sleeping by the lake. A huge herd of cape buffalo were about 500 yards downwind also at the lake. The lead cape buffalo spotted the pride and slowly edged toward it. Hosea said that they will charge the lions and try to kill them if they see them near the herd. It took some time to develop, but the lionesses (with 2 cubs) finally saw the cape buffalo and moved farther upwind to avoid the conflict, but the lion stayed his ground. Five cape buffalo broke off from the herd and went closer to the lion. At one point the cape buffalo and the lion were within 15 feet of each other roaring and fake charging! Unfortunately, the lion gave in and backed off. If the other 4 cape buffalo had not been there, Hosea said that the lion would have attacked. The lion went on and re-joined the pride. Oh well. I did take some pictures but we had had to back off to allow it to happen, so we will again rely on Tonya's high powered lens for this one. Just to keep track, in the Ngorongoro Crater we saw cape buffalo, warthog, elephant, vervet monkey, zebra, wildebeest, lioness/lion, rhinoceros, cheetah, ostrich, Thompson and Grant gazelle, and tons of flamingos and other birds. 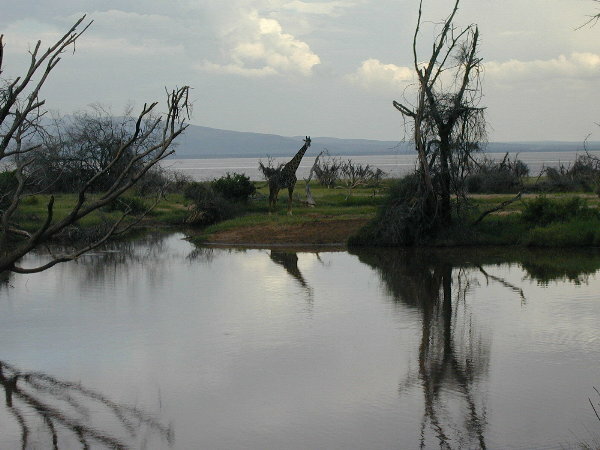 There are no giraffe in the crater because the sides are too steep for them to traverse. On our drive around from Ngorongoro Crater to Oldu Pai Gorge we saw many giraffe, hyena, ostrich, gazelle, and wildebeeste. For miles there were thousands of animals for as far as the eye could see on both sides of the road. We were told that this is the time of year that the wildebeest and Zebra go to the plains along that road to birth their young, since there are fewer predators than in the crater. We saw a ton of newborn wildebeest and zebra, even some mothers with their umbilical cords still hanging out . 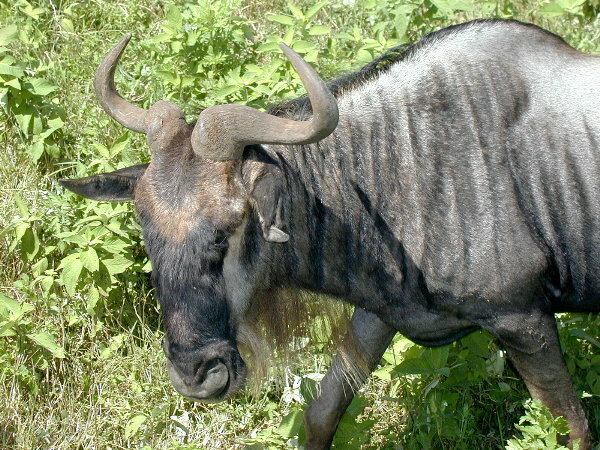 Hosea said that a baby wildebeest can run as fast as a full-grown wildebeest 15 minutes after being born -- but they are still at high risk because they are smaller and picked out of the crowd by the predators. We saw a lot of small packs of hyena. At one point we saw a hyena asleep in the water filled ditch on the side of the road. He looked sick, or maybe he had just eaten too much, because he barely moved when we got close. 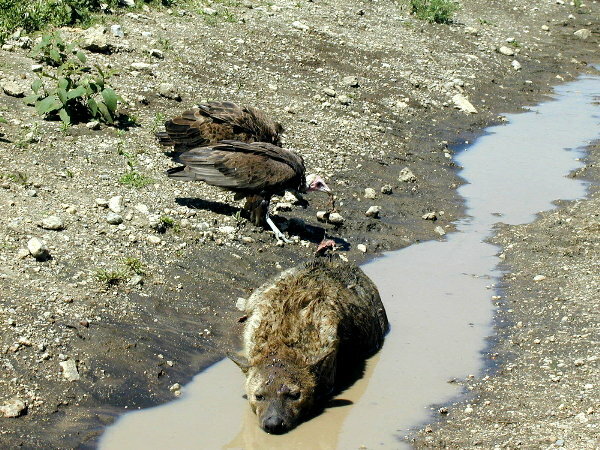 Then a bunch of vultures came down by him and started picking apart the kill he had practically lying under him. They would scurry up, grab a piece of meat and then jump away to eat it. A pack of hyena started approaching the one hyena -- Hosea said they were likely going to kill and eat the slow moving one, and maybe some vultures at the same time. But other trucks came by and scared all of them away! When we arrived at Oldu Pai Gorge we explored the museum and heard a lecture. The Oldu Pai Gorge (misspelled 'Oldu Vai' by the first visitors, and now locals are trying to correct it back to 'Oldu Pai') is the place where Louis and Mary Leakey found the oldest human fossils from 1931-1990's. They found the oldest upright walking creature footprints dated to 3.6 million years old. They found a homo-sapien predecessor (homo hibilis) dated to 1.5 million years old. The museum has extreme detail of the all the work done there in the past 6 decades. They still have digs there 2 months every year. They hope to find the 'missing' link to fill the gap between 1.5 million and 3.6 million years ago. 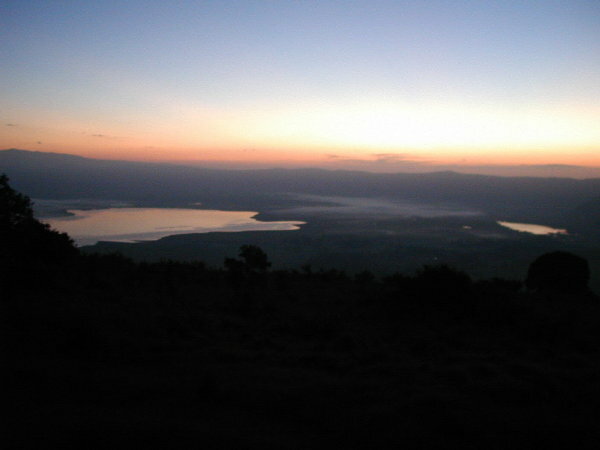 We had not realized until today that all the land around that area, including the crater and the gorge, are part of the Ngorongoro Conservation Area, which has been set aside as protected land. 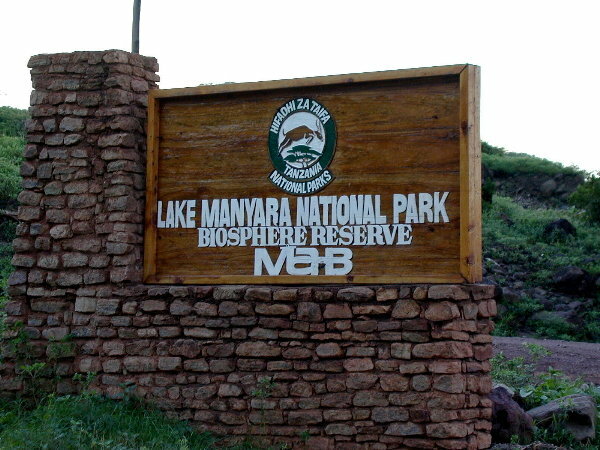 As a side note....one of the most notable tribes inhabiting Ngorongoro Conservation Area is the Masai tribe. They are the ones that typically dressed in the deep red wraps with the jewelry and head decorations. They are taking advantage of their notoriety in a way that many other non-Masai locals and the government frown upon -- they are hawking themselves on the side of the road to tourists for pictures. There are groups of them every 1/2 mile, all dressed up, waving at tourists to stop and take a picture. We heard it was $5/picture, or $50 to visit their homes and take pictures. Most locals consider this as 'lazy' and not wanting to do real work. The government is trying to direct them towards being less dependent on tourism and continue raising cattle and other means of living. We finally reached the Serengeti National Park (easily drove 100 miles on very bumpy roads). On our drive the next 50 miles to get to the lodge, we stopped and saw hippopotamus in a pond. We drove way out of our way down extremely rough terrain looking for close-ups of cheetah, but only found some sleeping lionesses. We did find a leopard hanging in a tree. A marked difference in the Serengeti is the vast areas of almost no animals -- some gazelles in the distance but few other animals. Supposedly, with the very odd weather situation this year (lots of rain in January) the animals migrated sooner than expected, so there were almost none remaining, and thus few lions/cheetah/leopard because they follow their food source on the migration. 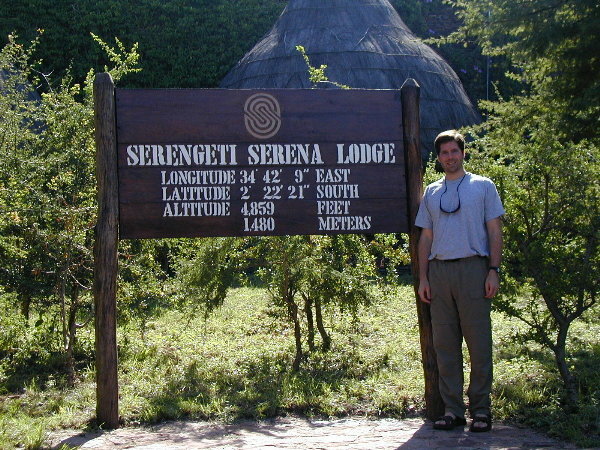 The Serengeti Serena Lodge lived up to our heightened expectations. 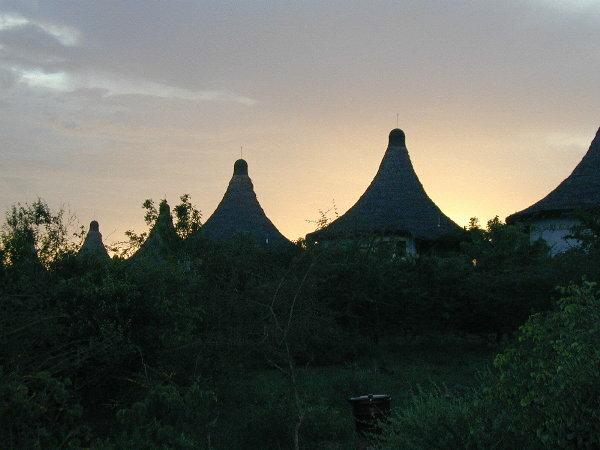 It was very luxurious and all the rooms had perfect views of the sunset over the Serengeti. hills. Woke up at 6:30, thinking cats would be moving. No cats, not much of anything! It started making sense since we saw few animals at all. Actually, we saw a number of 'new' animals, like hippopotamus, dik dik (tiny deer), water buck, etc, but no very exciting animals, and especially no cats. Dan skipped the afternoon, drive to avoid the pot holed ride (he always sat in the far back of the Land Cruiser), and to update the web site. Tonya and Kristen saw baboons and some more hippopotamus, but nothing else worth mentioning during their 4+ hour drive. We invited Hosea, our guide, to dinner with us. He is so friendly and professional. He explained the extreme measures A&K goes to to to make sure our trip is optimal and uninterrupted by misfortune. We also talked about the differences in attitude of the Tanzanians. He agreed that since there are few tribal issues, they are very welcoming of foreigners (not just for the money!). Kenyans have more tribes and therefore are more closed to foreigners, except for making money from them. 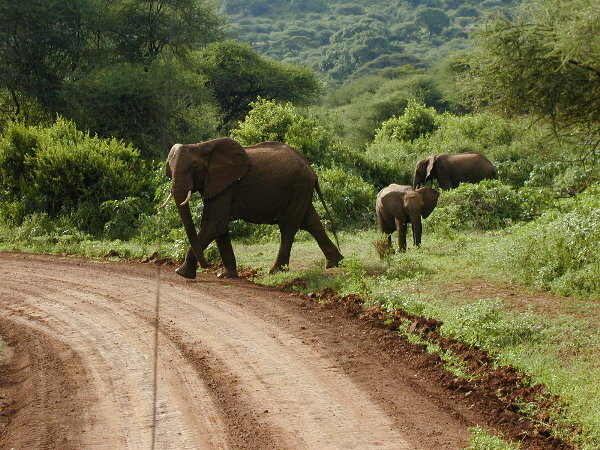 We went on a morning game drive on our way to the local airport. Only unique animals were a breeding herd of about 100 elephant and babies. Other than that there were very few animals -- not the time of year for the Serengeti. We flew out of a grass/dirt runway with a plane that held 8 people. See Mt. Kilimanjaro-Getting There. Comparing the amount of baggage we each brought...Kristen has the bags for both of us, compared to the 2 bags just for Tonya. Tonya, lighten up! 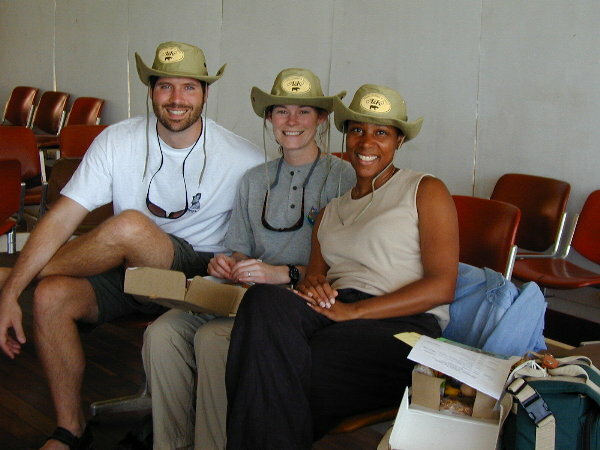 Waiting at the Kilimanjaro airport for the flight to Lake Manyara -- we are anxiously anticipating our safari! 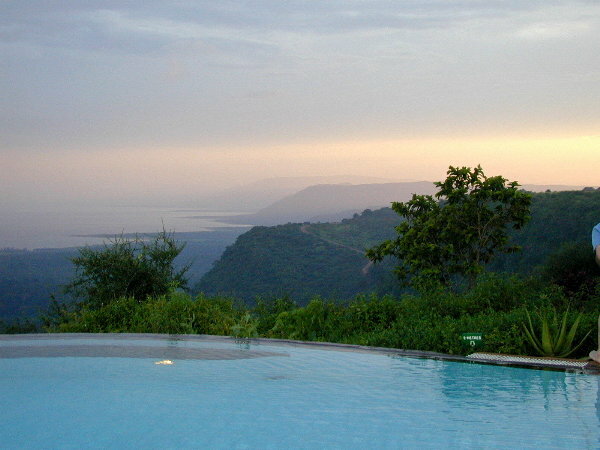 Day 1 of the safari we stayed at the Lake Manyara Serena Lodge, overlooking the game park. Although the rooms looked like huts from the outside, they were not. They were quite comfortable, for the middle of nowhere. The pool at the lodge is built on the side of the ridge overlooking the park (very far below). We enter the game park for our game drives. 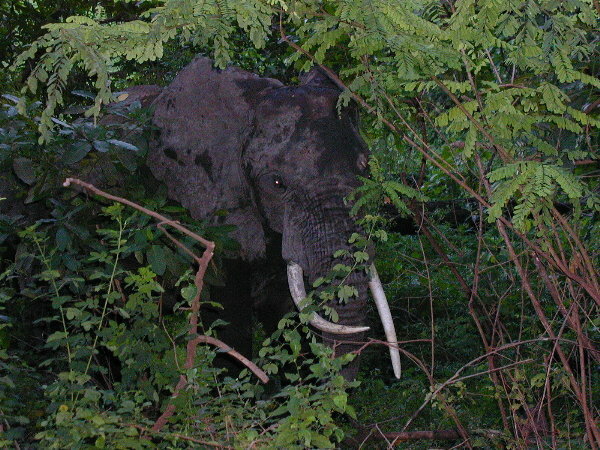 A large elephant stepping out of the woods right at our truck. Mom and kid showing us their back sides. 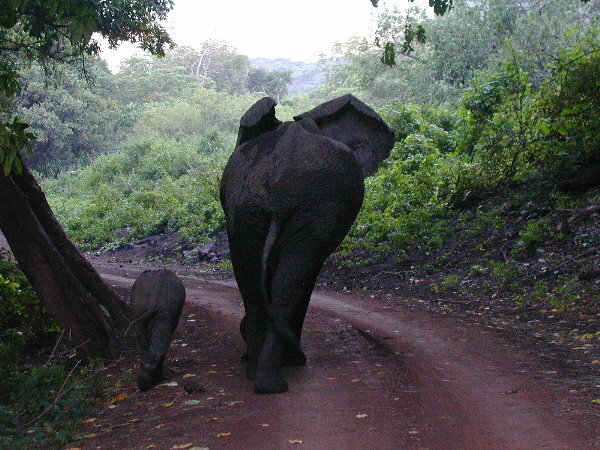 Another mom and kid crossing the road. 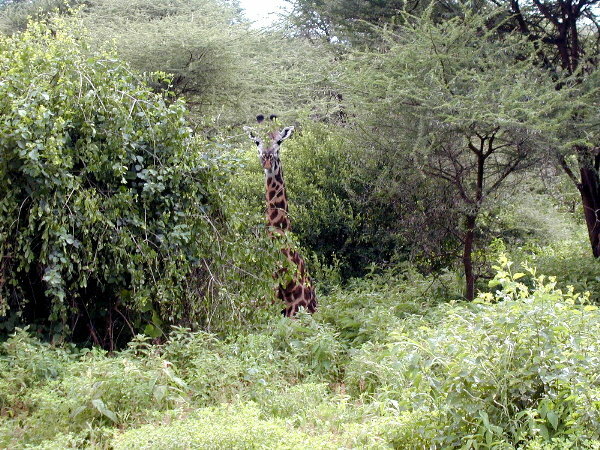 Lots of giraffe in Lake Manyara park. 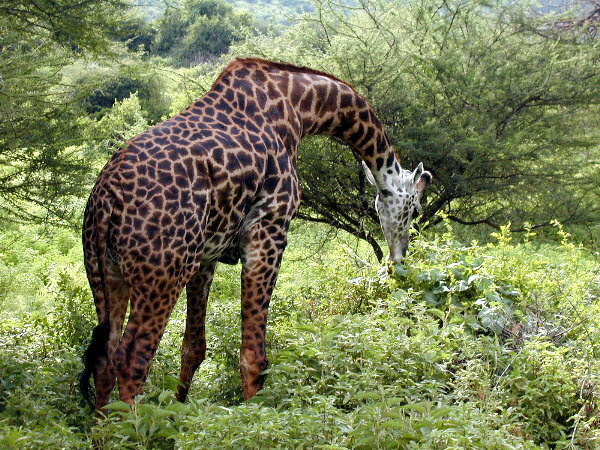 This one is sitting down -- you don't often see a giraffe sitting! A nice reflection of a giraffe in the water. 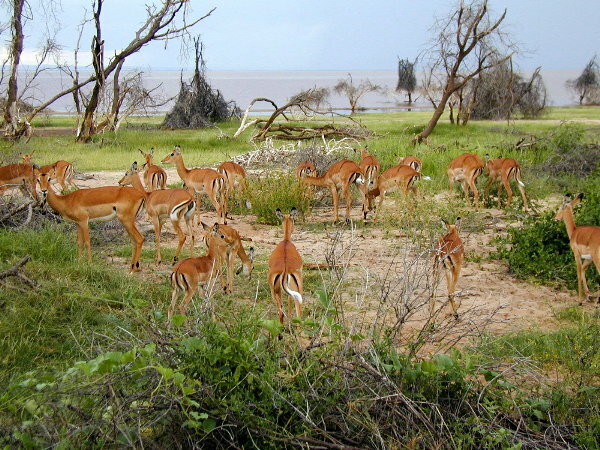 A sad bachelor herd of impala -- they lost out, no women for them! 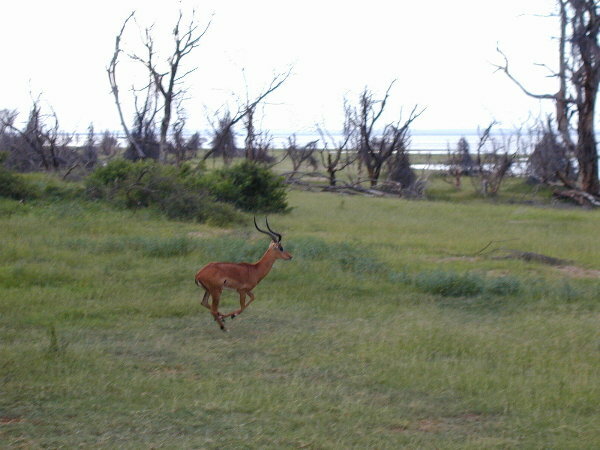 ...and his harem of female impalas. 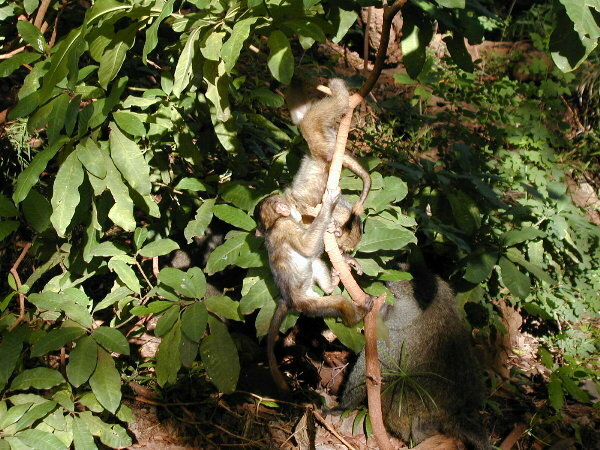 Baby baboons playing on a tree. 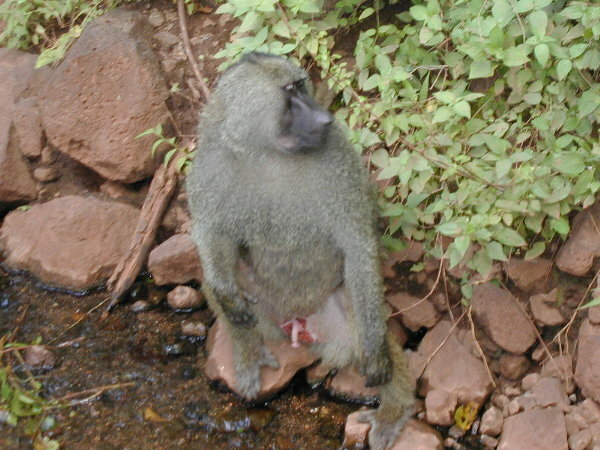 The baboons were everywhere! 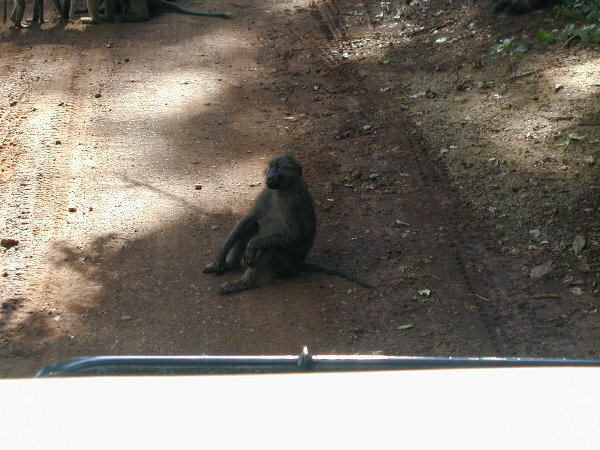 Baboons liked to hang out in the road and make you make them move. Don't show this one to the kids! 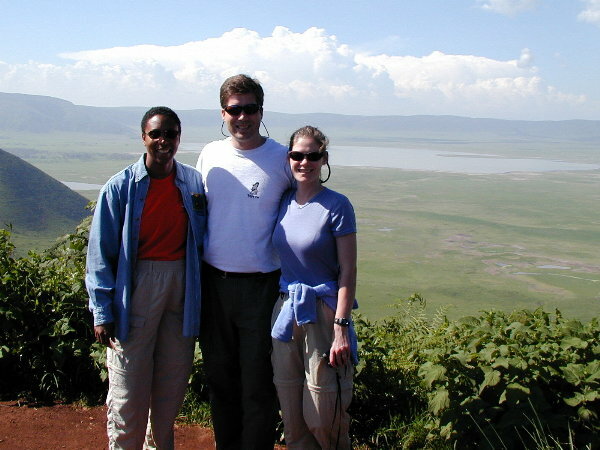 We next moved on to the Ngorongoro Crater where we stayed at another Serena Lodge. 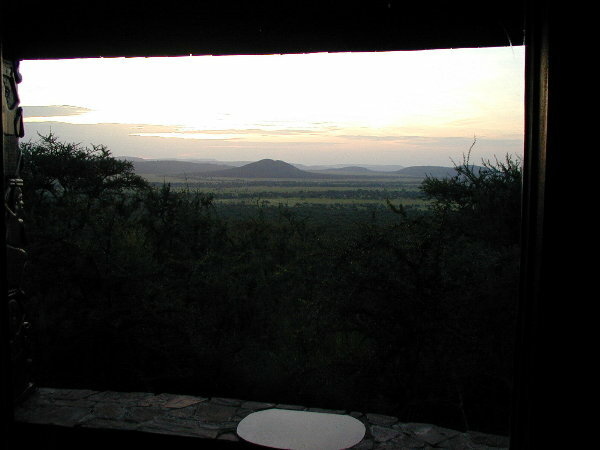 Our view from the room, overlooking the crater which is the game park. Sunrise view from the porch off our room. The sunrise on the next day. 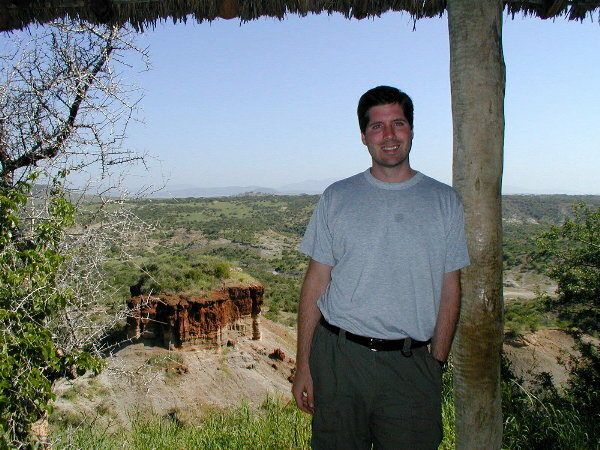 As we drive toward the game park/crater, we stop for a picture overlooking the crater. A panoramic shot of the crater. The crater is very popular! Here we are waiting with the crowd to get in. 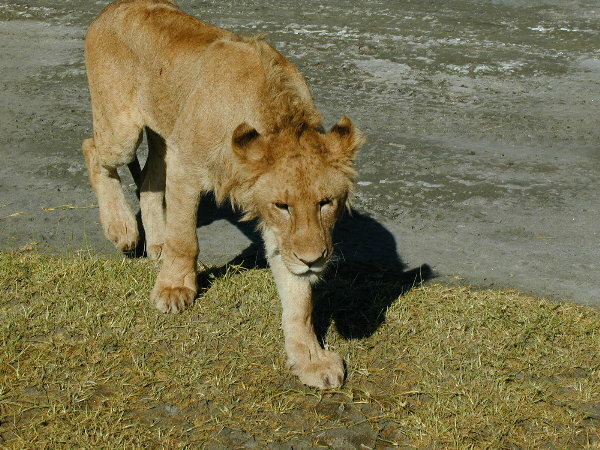 A lioness walking up to our truck. 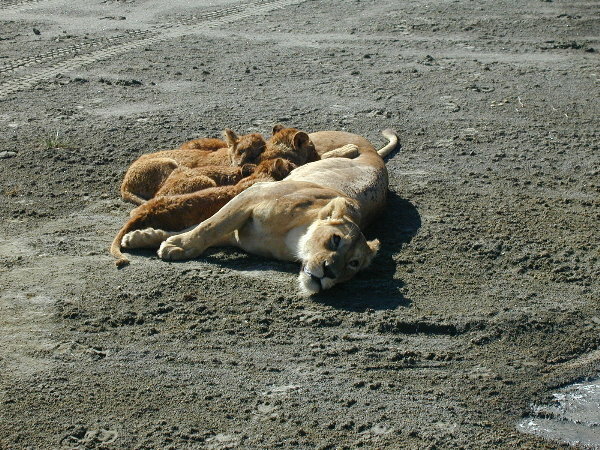 A mother lioness and her cubs. 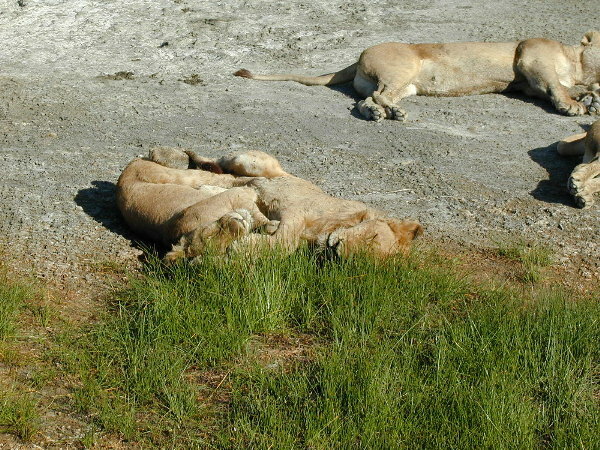 Lionesses cuddling during an afternoon nap. Clearly, the lions are not threatened by the vehicles! Our viewing positions on the game drives. 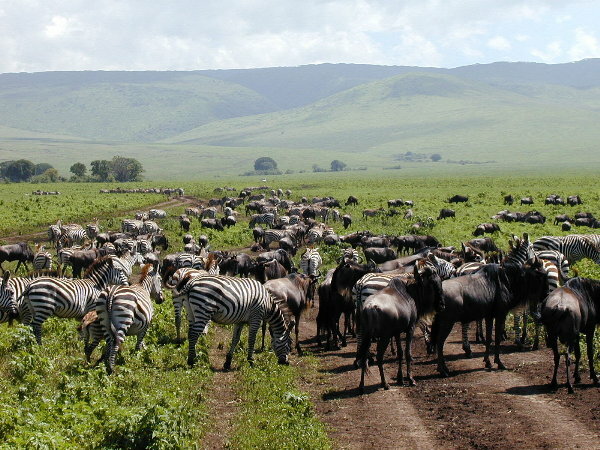 Herds of zebra and wildebeeste were everywhere in the crater. A one day old 'kill'. Pretty sad (and smelly). 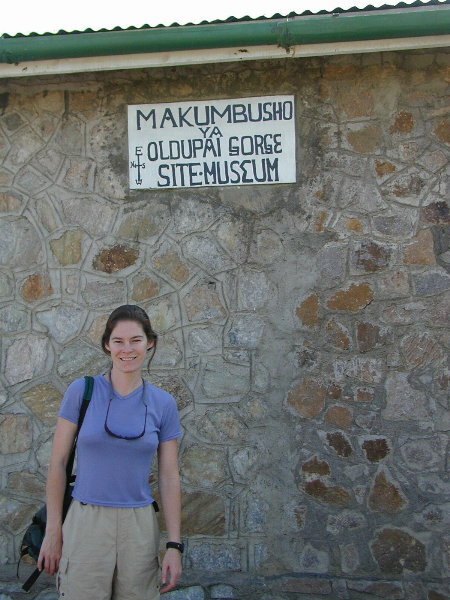 Kristen standing at the entrance to Oldu Pai Gorge museum. Dan standing at the viewing area overlooking the gorge. 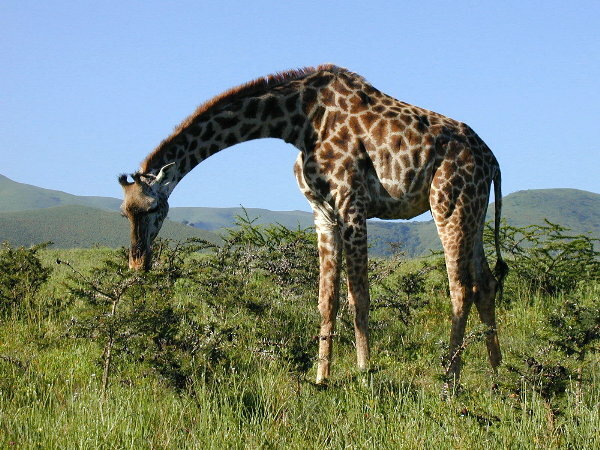 One of the many giraffe on the road from Ngorongoro to Serengeti. 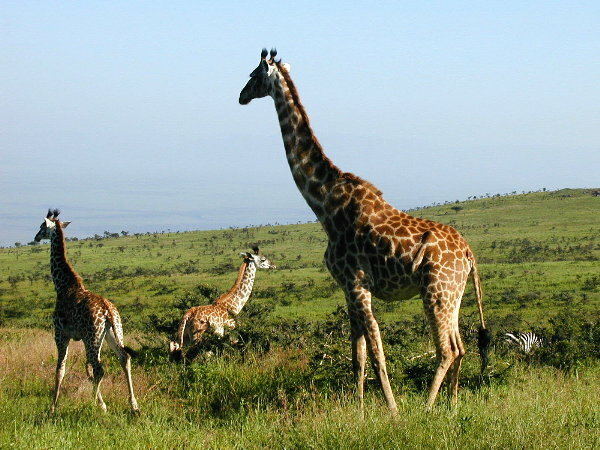 A giraffe family we saw on our way to Serengeti. 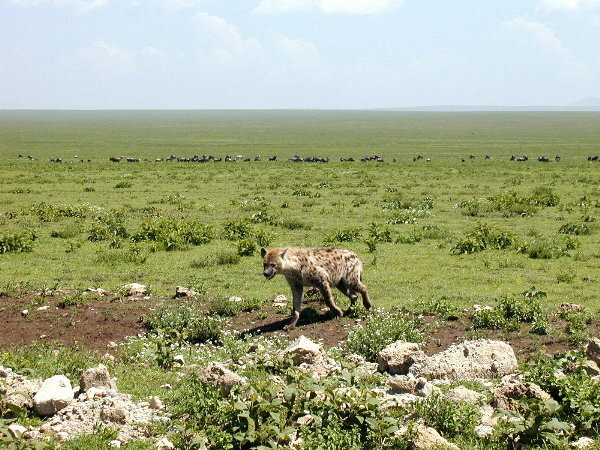 One of the many hyena on the plain -- be sure that the pack was nearby. 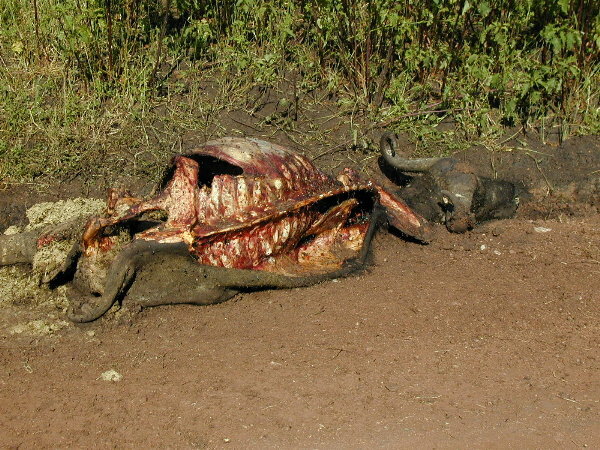 This hyena might have eaten a rotten kill -- he is not doing well. Now the vultures are finishing what is left. 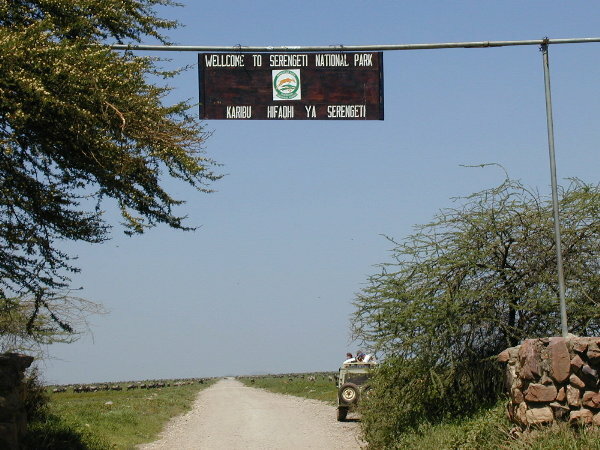 The entrance to the Serengeti National Park from the Ngorongoro Conservation Area (which includes the crater). 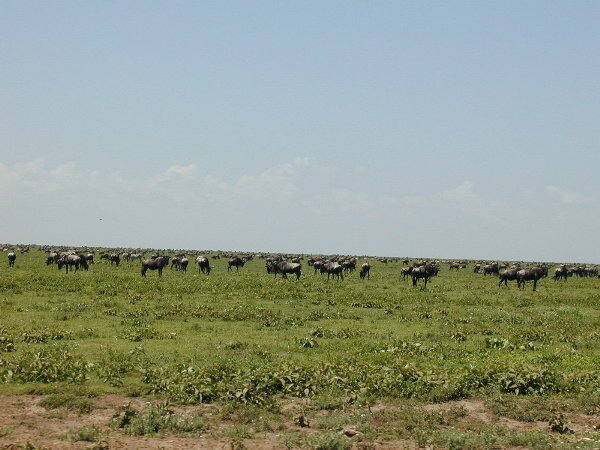 Huge herds of zebra and wildebeest filled the plains for as far as we could see for miles and miles. Dan and Kristen with herds in the in the background. Hippopotamus making a big point! We stayed at the Serengeti Serena Lodge. 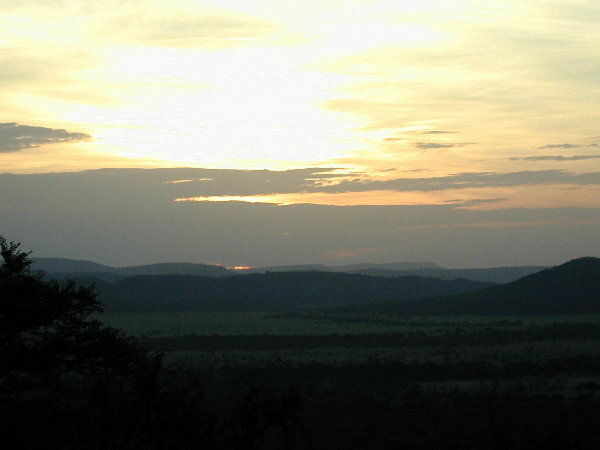 Our view of the serengeti from the room. A view of the sunset from our room. 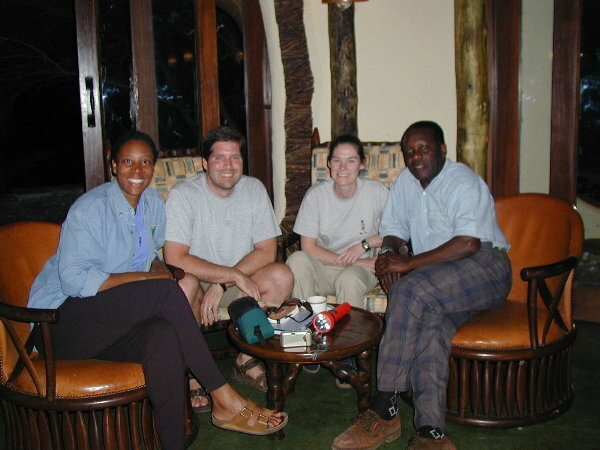 Hosea, our guide, with us at the Serena Lodge on our last night of the safari. Internet connection speed: NONE, no phones! English speaking TV channels (in our hotel): No TV's! 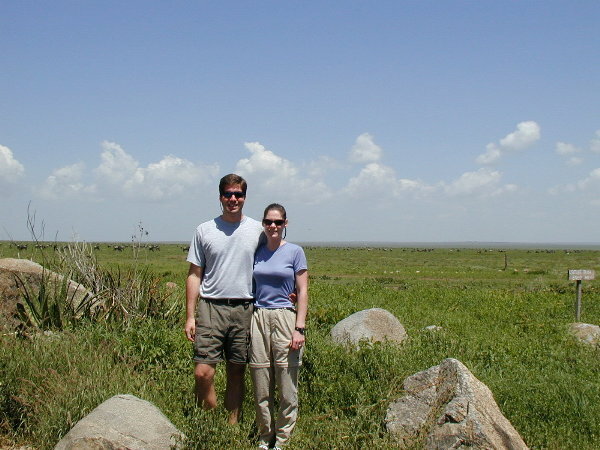 Our trip from Nairobi to our first stop on the safari, Lake Manyara, required 2 airplanes and 3 stops. After customs in a tiny Nairobi local airport, we flew in a 20 seat plane (rather large!) 45 minutes to Mt. 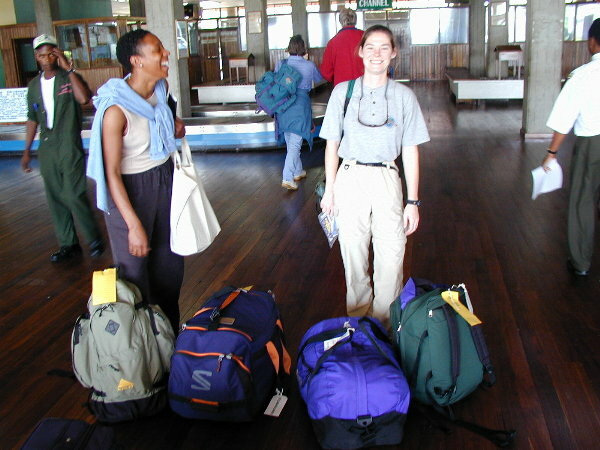 Kilimanjaro, Tanzania airport. A&K brought us lunch while waited for the next plane. Dan used the bathroom in the airport. When we came out of the stall, a local ran in and turned on the faucet, and handed him some rolled up toilet paper to dry -- then he reached out his hand for money! After Dan tipped him in some other country's currency, the guy went back to washing windows in the airport. The next plane was much smaller, though it still held 15 people (absolutely no leg or head room). We flew first 20 minutes to Arusha airport. We sat for 5 minutes then we flew another 20 minutes to Lake Manyara airport -- the only dirt runway of the three stops. Hosea, our A&K guide for the week took us to the hotel. 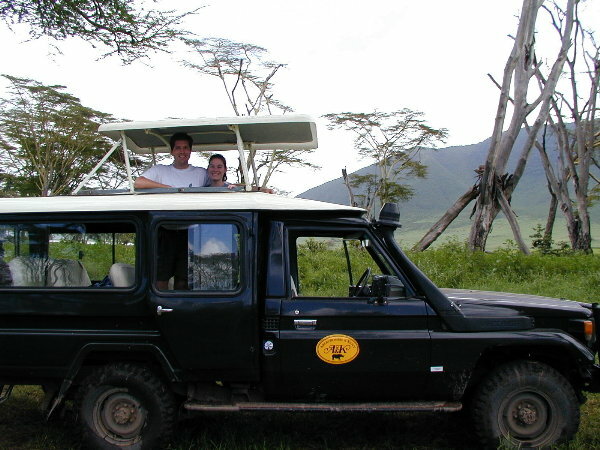 All the trips during the week between game parks were done in the same A&K Land Cruiser driven by Hosea. www.gibbsfarm.ne Lunch was excellent. Seems like would be great inn.